Nidoqueen in game: 553 Who? Important notice! Pokemon Nidoqueen is a fictional character of humans. She evolves from Nidorina when exposed to a Moon Stone. She is the final form of Nidoran♀. She is related to the Nidoran♂ line, but unlike Nidoran♀, Nidoqueen cannot breed. 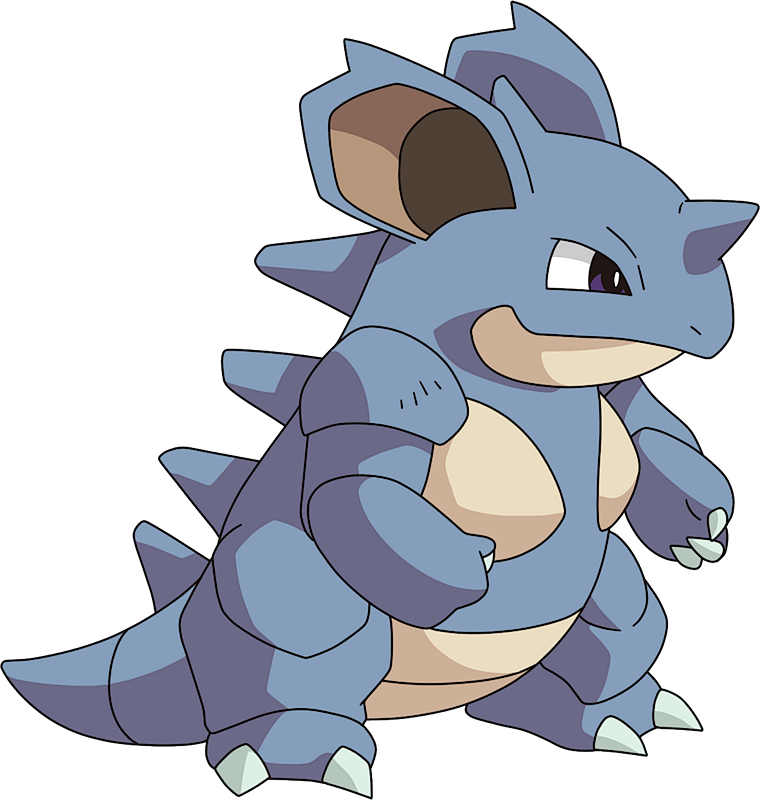 Nidoqueen is a large, bipedal blue Pokémon with distinct reptilian features. Its body is encased with extremely hard scales that serve as excellent protection from any attack and stand up when Nidoqueen is excited or provoked. It has a blunt snout, narrow brown eyes, and large ears with brown insides. There is a small horn on its forehead, and single spine on each ear, and there is a line of toxic spikes running down the length of its back. Each hand has three short claws and each foot was two claws. Its lower jaw, the front of its abdomen, and two plates on its chest are cream-colored. It has a thick, powerful tail. Nidoqueen can be quite fierce and is very protective over its young. 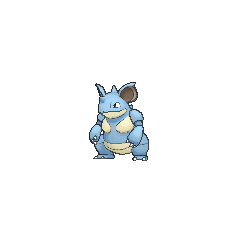 This Pokémon is at its strongest when it is defending its young, and will try to seal the entrance to its burrow to protect them. When in contact with foes, it can poison them with the spikes from its back or cause small tremors by slamming the ground. It is also adept at sending foes flying with harsh tackles and it uses its hefty bulk to execute powerful moves. Nidoqueen lives in hot savannas and plains. 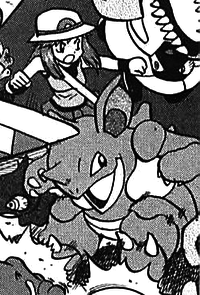 Nidoqueen's first appearance was in Mewtwo Strikes Back. A Nidoqueen owned by Fergus was one of the Pokémon that were captured and cloned by Mewtwo. The Nidoqueen clone was seen again in Mewtwo Returns, along with what was apparently a Nidoqueen baby despite the fact that Nidoqueen cannot breed and her unevolved form is Nidoran♀. Navel Island Gym Leader Danny owns a Nidoqueen. 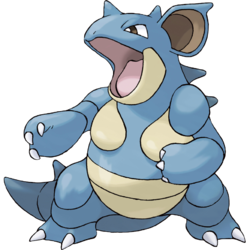 This Nidoqueen was shown competing against Ash's Lapras in Navel Maneuvers in which the challenge was freezing a super-heated geyser. Afterwards, this Nidoqueen helped Danny's Machoke and Scyther carve Danny's sled. She reappeared in a flashback in A Way Off Day Off and in another flashback in Hello, Pummelo!. Gary Oak was shown to have a Nidoqueen after Ash's trip on the Orange Islands. Gary first used his Nidoqueen to defend his grandfather's lab from Team Rocket agents Jessie, James and Meowth in A Tent Situation. Gary later used Nidoqueen in Can't Beat the Heat! in the Johto League. Gary's Nidoqueen defeated Ash's Tauros and was defeated by Ash's Snorlax. A Nidoqueen appeared under the ownership of Andi in The Bicker the Better. Her boyfriend, Oscar, had a Nidoking. Four Nidoqueen appeared in Arceus and the Jewel of Life under the ownership of Damos. Nidoqueen also appeared in The Power of One. Multiple Nidoqueen also appeared in Celebi: Voice of the Forest. 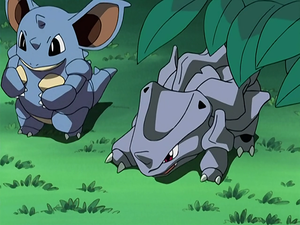 In Extreme Pokémon!, a Nidoqueen appeared with her Trainer, participating in the Extreme Pokémon Race. 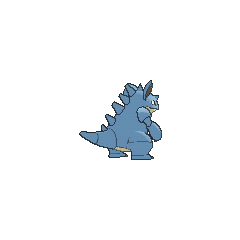 A Nidoqueen appeared with a blue jaw instead of a cream-colored one due to an error in Historical Mystery Tour! with a Nidoking. A Nidoqueen appeared in A Performance Pop Quiz!, under the ownership of a Pokémon Performer participating in the Anistar City Pokémon Showcase. She reappeared in Master Class is in Session!, where it was used in the Master Class Pokémon Showcase in Gloire City. 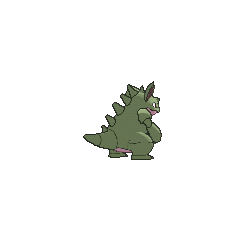 A Nidoqueen appeared in SM003, as a silhouette. In File 3: Giovanni, Giovanni sent out his Nidoqueen against Red's Charizard during a confrontation in Silph Co. She was able to defeat Charizard, thus allowing Giovanni to successfully retreat. Red caught a Nidoqueen in Long Live the Nidoking! when he attempted to catch a Nidoking. Giovanni has a Nidoqueen as well, as seen in his Gym battle against Red in Golly, Golem!, where she almost faintedSnor by throwing him through the wall, but was eventually beaten by Pika's Thunderbolt in Long Live the Nidoqueen!?. She was later seen very briefly again in the Sevii Islands when he used her and his Nidoking to manhandle a biker whom Deoxys had ambushed. A Nidoqueen was seen in a Poké Ball at Oak's Laboratory in Cherrygrove in Off Course with Corsola. Green had a Nidoran♀ in Pokémon Adventures that later evolved into a Nidorina and in Give It Your Best, Blastoise she evolved into Nidoqueen to provide support for Blasty's Hydro Cannon alongside her Granbull and Jiggly. A Nidoqueen appeared in The Last Battle XIII as one of the Pokémon sent to help the fight in Ilex Forest. A Nidoqueen appeared in Skirting Around Surskit I as a rental Pokémon that Guile Hideout stole. While taking over the Silph Co., Giovanni used Nidoqueen to hold the Silph Co. boss hostage. Nidoqueen shares traits of rhinoceroses, gorillas, rabbits and porcupines. The coverings on its chest and its lower abdomen collectively resemble a two-piece bikini.